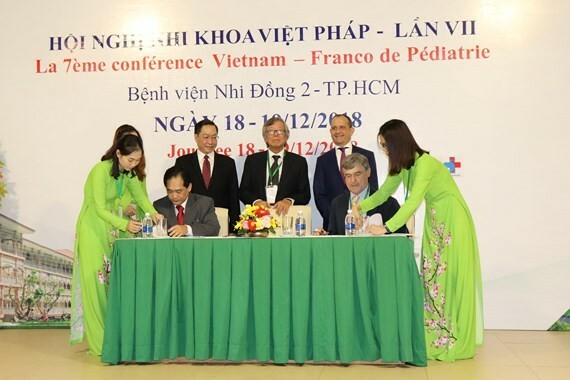 France will continue providing medical training to Vietnamese doctors and nurses by signing an agreement between the Children Hospital No.2 and French CHU Grenoble Institute yesterday . According to the agreement, French institute will train Vietnamese medical workers through teleconferences and educational exchanges. Since 2013, around 4,000 Vietnamese young doctors of all fields in medical centers in Hanoi, Thua Thien – Hue, Ho Chi Minh City and the Mekong delta City of Can Tho have been sent to France for training. Many of French-trained doctors are keeping important position in medical institutes. For instance, more than 100 French-trained doctors are nucleus of two universities and three children hospitals in HCMC and core group of organ transplants in the Children Hospital No.2. Also on the day, the seventh medical Vietnam-French conference named “Heart, Respiratory Disease and Scan was held by the infirmary with the participation of 30 Vietnamese and French heart experts, representative from the Department of Health in Ho Chi Minh City and French Consulate in HCMC. Participants in the conference initiated by former director of the Department of Health late Professor Duong Quang Trung shared useful update of treatment, said Director of the hospital Dr. Trinh Huu Tung. During the two-day conference, participants delivered reports centering around prenatal screening, medicine and ethical law, diagnosis and treatment of lung before and after birth, role of pediatric surgeons, prenatal scan of lung and diagnosis. Highly valuing the Children Hospital No.2’s achievement in past time, Director of the Department of Health Dr. Nguyen Tan Binh expected that Vietnamese doctors’ skill will be much improved with the French institute’s aid of training.